When was the last time someone made a mixtape for you? I just did ! Enjoy. Seen at MOCCA this weekend this gorgeous illustration of Akira Kurosawa’s Seven Samurai by Greg Ruth. This is a reproduction of the print priced very reasonably at $16. I find the original illustration far superior however but at $500, it has a bit of a sticker shock. I have to do some thinking. Print can be bought part of a set of 9 on the artist’s Etsy for $62. I let this set go. I don’t know how it happened but I did. It went up for auction in July of last year and was sold for $38 with buyer’s premium, which means the highest bidder was probably at $6. Retrospectively, I would have easily spent $100. It was on my watch list and I didn’t even bother bidding on it. I mean , these are 13¾ x 19¼”. I can see one or two of those framed and hanging on a wall in the apartment somewhere. Anyway, for your viewing pleasure. Set originally posted on my lobby cards Tumblr. Only 50 years left to wait! We’re experiencing slow loading or intermittent errors on certain pages and are working quickly to restore performance. They really went for something different this time. Every week or so, I stop by my local comic book store and pickup an assortment of what has been fairly recently released. I don’t pretend to be an expert, often my choices are very subjective and I’m rarely enthusiastic. Why do I keep doing it? Because occasionally I strike gold. Let’s get on with this week’s selection. Li’l Depressed Boy #1: This first issue promptly sold out and was sent back to press for a second printing to be released March 23. I’ll admit, I knew nothing about it and picked it off the shelf without even thinking or opening it. Clearly the selling point was the cover. Checking the first print, I understand why I overlooked the original run. This does nothing for me but make a John Cusack/”Say Anything” reference and you’ve got me! Yes, I am that shallow. Li’l Depressed Boy, a not too distant relative of Sackboy, meets a yet to be named girl at the local dinner. They talk video games, meet again at the laundromat then go out on a date and kiss. The end… at least for this first issue. Throughout the pages, pop culture references abound with a predilection for music and video games and on the surface this story of boy meet girl could be dismissed as a knock-off of Scott Pilgrim but not so fast!Sina Grace‘s art and S. Steven Struble‘s coloring could not only be more completely different from Bryan Lee O’Malley but Li’l Depressed Boy is not so much about the destination as it is about the journey. It’s a sum of subtle life moments we can all (or most of us anyway) relate to. Look familiar? I thought so, we’ve all been there. 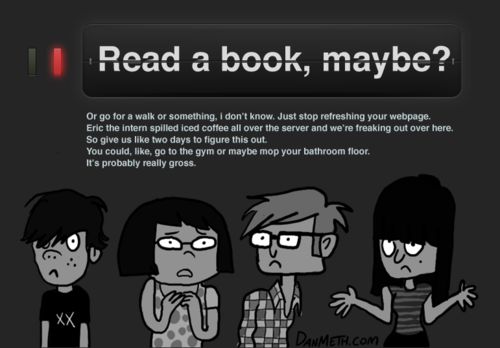 If you’ve clicked on the page above you now know what I ignored until doing some research for this post, Li’l Depressed Boy is a web comic and the published first issue starts here but I don’t think I’ll read it online because I enjoyed it enough I want these guys to make money if I can help it. I’ll keep buying the print version. Issue #2 was published March 9, #3 will be released April 13. 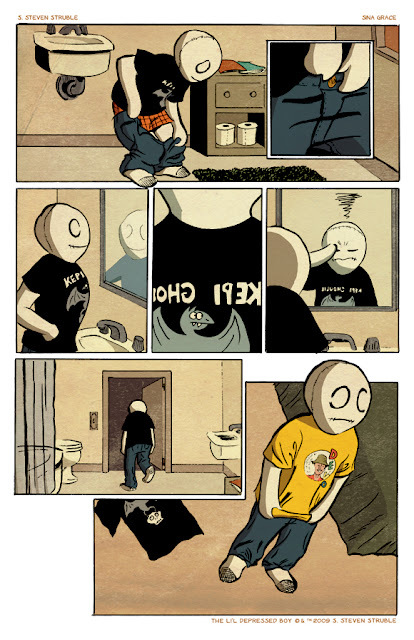 LI’L DEPRESSED BOY #1 (DEC100434), a 32-page full-color comic book for $2.99, published February 9, 2011 (second print March 23, 2011). Published by Image Comics, the comic is available online at www.lildepressedboy.com. It is the somewhat unique product of two brothers’ work. The pencils, inks and lettering are by Ethan Nicolle and the story is by his kid brother Malachai who happens to be 6 year old. Added to this dynamic duo for colors is Dirk Erik Schulz, German comic artist who’s only Internet presence appears to be on DeviantArt. I had a couple of concerns going in. First I was worried I might suffer from Axe Cop fatigue. A comic written by a 6 year old can easily be a one trick pony and second it’s the first Axe Cop in color. I was quickly reassured on the colors front. Dirk Erik Schulz plays off a nice beige/brown/green pallet with some deep blues and purples for the bad guys and flashes of red when things blow up. On the story front however, it took me more time to warm up. It makes as much sense as it ever did. Axe Cop hangs out at a restaurant with his partner Dinosaur Soldier (he used to be flute cop, read the web comic, I promise it’s great!) when a planet appears in the sky. Our heroes have a hunch it’s a bad guy planet but need to take a picture of it to take it back to the lab for analysis. All of this would be easy if only the real cops stopped hassling Axe Cop at every corner. The story started a little slow for my personal taste or maybe I was missing the punch in the face/WTF effect of the first web comic but from the point Wexter the T-Rex shows up it turns completely mad and I was laughing out loud in the subway reading it. 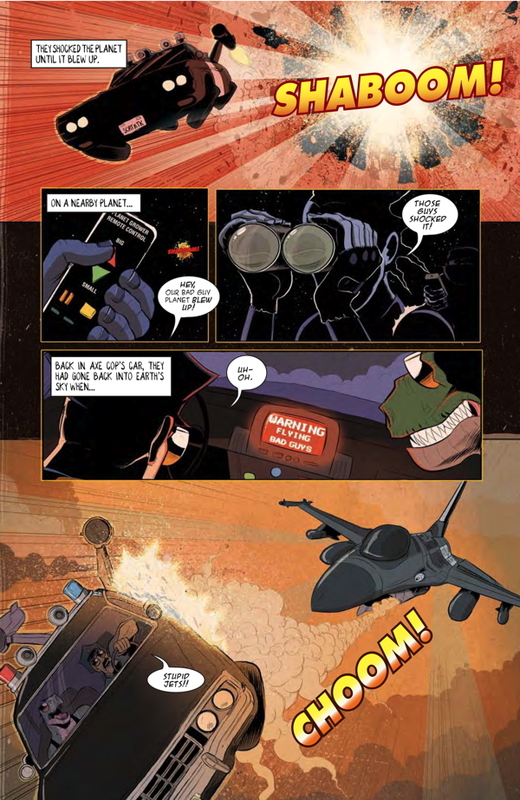 They’ve also managed to strike the right balance regarding the previous adventures of Axe Cop. Having read them is not necessary to enjoy or understand this comic but it makes it a more enjoyable experience if you have with the inclusion of familiar characters like Uni-Man (I’m hoping we’ll see the return of Uni-Baby at some point) and recurring gags like the cat suit Axe Cop wears when he goes out at night. 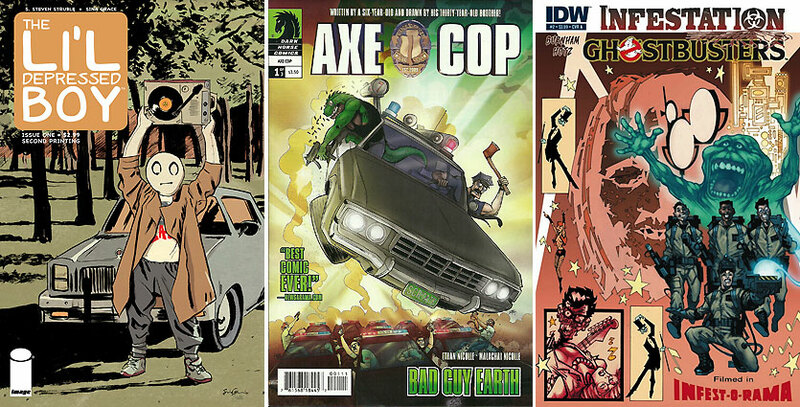 I loved these news adventures of Axe Cop and I’m sad thinking that it will only be for a limited run of 3 issues. Issue #2 will be published April 6, #3 will be released May 4. AXE COP: BAD GUY EARTH #1 (76156818445700111), a 32-page full-color comic book for $3.50 published March 2, 2011 Published by Dark Horse Comics, and other Axe Cop adventure are available online at www.axecop.com. Ghostbusters Infestation #2: Let me start by saying I didn’t particularly like the first issue so why did I come for seconds you might ask? Well for one thing I’m an optimist, I thought it might get better. That wasn’t a baseless crazy notion mind you, this mini-series is part of a larger Infestation cycle and I quite enjoyed their spin on Star Trek but didn’t bother with the Transformers and G.I. Joe stories. I never cared for Transformers (too old I suppose) and I played with G.I. Joe’s as a kid (“Action Joe” in France) but was never into the comics or animated series. I still find the Fenslerfilm take on the old PSA ads hilarious though but I digress. What is it about? The premise of the entire series is a crossover of known franchises (Star Trek, Transformers, G.I. Joe, Ghostbusters) with zombies. 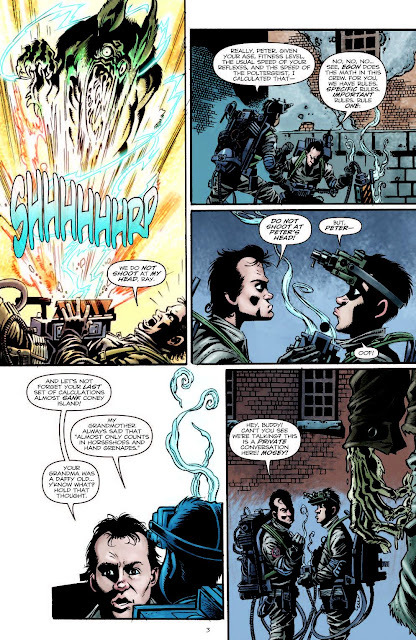 This is how it is introduced: “In a different dimension, a zombie hive-mind takes over the body of a covert vampire soldier code-named Britt. Aiming to spread the zombie apocalypse to all dimensions using magically enhanced technology. Britt is able to open portals to four different dimensions before she is stopped.” Whatever, zombies are fun. The artwork is by Kayle Hotz, a 20 years veteran who has worked for DC, Marvel, Image, Dark Horse and IDW. It’s pretty good and I suspect his work on The Zombie and Man-Thing landed him this gig. It is also well served by Dan Brown‘s colors another veteran in the industry so it’s clear that IDW brought some professionals on board and if the artwork is not mind blowing it’s really good. The artwork is not the issue here, Erik Burnham‘s writing is. 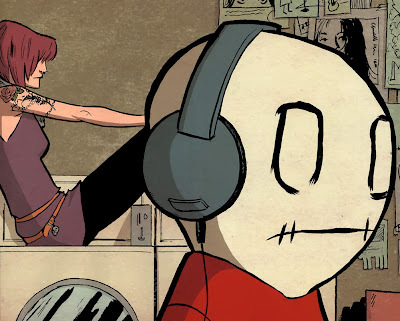 The first issue felt like a lot of laborious exposition and technobabble but I hoped that it was to get it all out of the way and move to some serious action. I was mistaken. This second issue goes for more of the same. By page 6, I didn’t even want to try to understand why the villainess from another dimension, Britt, wanted the Ghostbusters to capture some of the Destructor’s essence. Even now, I’m not even sure why it mattered. Ghostbusters Infestation #2, a 32-page full-color comic book for $3.99 published March 23, 2011 by IDW. In other news, I have ordered from Amazon the Finder Library: Volume 1 and the Deluxe edition of Starstruck. I’ll be impatiently waiting by the door now. I decided to celebrate Houdini’s 137th birthday with an epic magic trick: Free music! Fine, It’s not really magic or epic since Spin magazine has been doing it every month but still, it’s free music so what are you waiting for? Besides featuring Starfucker which explain the Lichtenstein-esque image above, it also has French Band Yelle’s addictive song “Safari Disco Club”. A music video well worth checking.